This glorious Pear Cut Blue untreated Sapphire gemstone and solid Sterling Silver with Yellow Gold gemstone setting has been designed and created in collaboration with one of our clients as part of the bespoke services offered by Julian Stephens. This contemporary, sleek design is inspired by our clients who are keen surfers and this unique, one of a kind design was created to mimic the rolling waves, taking visual cues from a rip curl motif. 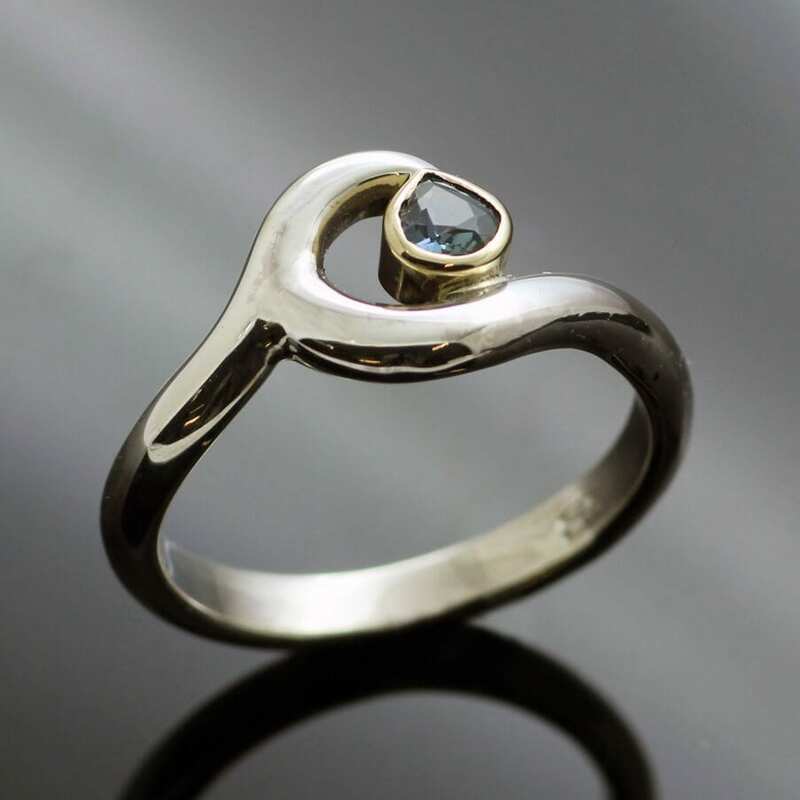 A beautiful unheated, natural Blue Sapphire in a stunning teal blue shade which has been cut into a lovely Pear shape proudly takes centre stage in this bespoke design. 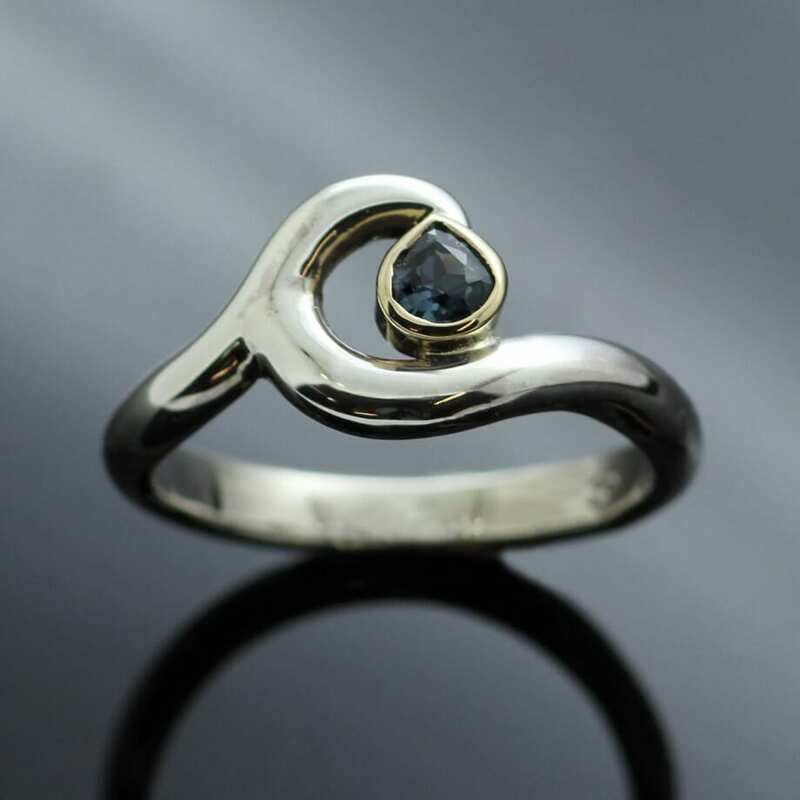 This gorgeous teal blue Sapphire is then expertly hand set in solid 18ct Yellow Gold for a stunning contrast that enhances the colours in this natural gemstone, finally the gem is mounted onto a unique, handcrafted undulating Sterling Silver ring shank, designed to evoke a sense of rolling waves and a beautiful seascape. This one of a kind design is then finished with a high shine hand polish for extra glossy sparkle. The Blue Sapphire ring has been meticulously hand crafted by our master Goldsmith Julian Stephens from his Brighton workshop and proudly bears his exclusive makers mark and Hallmarks as an indication of its thoughtful design, quality materials and execution.